Virgin Galactic's VSS Unity mid-flight on July 26, 2018. 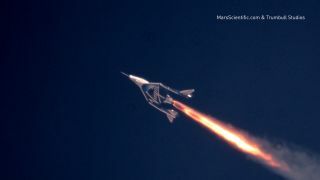 Virgin Galactic's newest space plane took to the skies again today (July 26) for its third rocket-powered test flight, reaching higher in the atmosphere than the company had previously. The VSS Unity is a SpaceShipTwo vehicle designed to carry six commercial passengers and two pilots into space, where they will experience 5 minutes of weightlessness before gliding back down to Earth. Virgin Galactic's WhiteKnightTwo carrier aircraft (also known as VMS Eve) took off at approximately 11:45 a.m. EDT (1545 GMT), according to a tweet from the company, and raised the space plane to an altitude of 46,500 feet (14,000 meters) before releasing it to fly on its own. Virgin Galactic's suborbital space plane, the VSS Unity, completed its 14th test flight on July 26, 2018. "There she goes! #VMSEve & #VSSUnity have taken to the skies," Virgin Galactic tweeted. About an hour later, VSS Unity had separated from VMS Eve and was soaring toward space, the company tweeted. After separating, the VSS Unity fired its engines for 42 seconds, shifted to a nearly vertical angle and accelerated to 2.47 times the speed of sound. After gliding back down to Earth, the space plane touched down safely at Mojave Air and Space Port in California shortly before 1 p.m. EDT (1700 GMT). This was the first time the space plane had reached a region of Earth's atmosphere called the mesosphere, Virgin Galactic representatives said. "The planned 42-second rocket burn took pilots and [the] spaceship through the Stratosphere and, at an apogee of 170,800 ft [52,000 m], into the Mesosphere for the first time," Virgin Galactic representatives said in the statement. "This region, often referred to by scientists as the 'Ignorosphere,' is an under-studied atmospheric layer because it is above the range of balloon flight, and in the future is an area we can help the research community explore further." Today's flight marked the third powered flight for VSS Unity in less than four months, and it was the 14th flight overall. Since its first test flight on Sept. 8, 2016, the VSS Unity has completed seven "captive-carry" flights — in which it remains attached to the VMS Eve — and seven unpowered glide test flights. VSS Unity completed its first powered test flight on April 5 of this year, followed by a second powered flight on May 29. All three powered flights have been piloted, but without passengers on board. As with previous flights, today's test flight was designed in part to gather additional data about conditions in the cabin during flight, according to the company's statement. Virgin Galactic founder Sir Richard Branson said the company could launch space tourists aboard the VSS Unity by the end of 2018, and tickets are already on sale for $250,000 apiece.